The Low FODMAP Diet was created by a team at Monash University (Australia), led by Professor Peter Gibson and including Dr Shepherd and others. Research has demonstrated that the low FODMAP diet reduces symptoms in people who have been diagnosed with irritable bowel syndrome (IBS). It is now accepted and recommended as one of the most effective dietary therapies for irritable bowel syndrome. Excess fructose: Honey, apples, mango, pear, watermelon, high fructose corn syrup. Fructans: Artichokes, asparagus, beetroot, garlic, onion, wheat. Lactose: Milk, yogurt, ricotta cheese, ice cream. Galacto-oligosaccharides: Baked beans, kidney beans, lentils, chickpeas. Polyols: Apples, apricots, avocado, prunes, mushrooms, sorbitol, xylitol, isomalt. A low FODMAP diet produces significant relief for over three quarters of people with chronic digestive symptoms. Eventually you may be able to reintroduce some of the foods containing FODMAPs – one at a time – to monitor your reactions. However, for ongoing symptom relief it will probably be necessary to continue to restrict your intake of many foods. Fish, poultry, beef, bacon, tempeh, tofu, eggs, feta cheese, Swiss cheese, lactose-free milk, corn tortillas, gluten-free bread, quinoa, rice, oatmeal, chia seeds, almonds, bok choy, broccoli, zucchini, tomato, lettuce, pumpkin, potatoes, banana, kiwi fruit, tangerines, melon, pineapple, coffee, tea. The Complete Low-FODMAP Diet: A Revolutionary Plan for Managing IBS and Other Digestive Disorders retails at $18.95. Proven to relieve symptoms of irritable bowel syndrome and other gastrointestinal disorders. 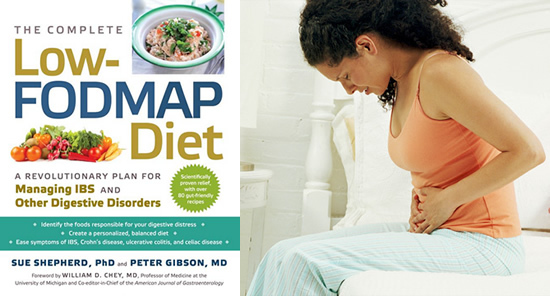 Provides detailed explanations of how FODMAPs can influence digestive health. Includes comprehensive meal plans and recipes. Offers advice on how to follow the diet for vegetarians, diabetics, celiac disease and children. Author is a leading expert in the field of irritable bowel syndrome research. Very restrictive and requires elimination of a wide variety of different foods. Difficult to eat in restaurants and other social situations. Most people will need to stay on the diet to continue to experience relief of symptoms. The diet is not effective for about one in four irritable bowel syndrome patients. A low FODMAP diet has been proven to provide relief from the symptoms of irritable bowel syndrome and other digestive disorders. This book explains what FODMAPs are, how they are involved in these conditions and outlines a practical plan for recovery. This way of eating is effective for over three quarters of irritable bowel syndrome patients. However, for the best results it is recommended to work with a trained nutritionist or dietitian. Shepherd, S., & Gibson, P. R. (2013). The Complete Low-FODMAP Diet: A Revolutionary Plan for Managing IBS and Other Digestive Disorders. Workman Publishing.